Definition at line 45 of file llalertdialog.h. Definition at line 48 of file llalertdialog.h. Definition at line 49 of file llalertdialog.h. Definition at line 50 of file llalertdialog.h. Definition at line 132 of file llalertdialog.h. Definition at line 51 of file llalertdialog.h. Definition at line 134 of file llalertdialog.cpp. References createDialog(), IGNORE_USE_DEFAULT, LLAlertDialogTemplate::mDefaultOption, LLAlertDialogTemplate::mEditLineText, LLAlertDialogTemplate::mIgnorable, LLAlertDialogTemplate::mIgnoreLabel, LLAlertDialogTemplate::mMessage, LLAlertDialogTemplate::mOptions, LLAlertDialogTemplate::mTitle, setCheckBox(), LLFloater::setTitle(), sStringAlwaysChoose, and sStringSkipNextTime. Definition at line 414 of file llalertdialog.cpp. References LLLineEditor::getText(), LLCheckBoxCtrl::getValue(), LLControlGroup::getWarning(), IGNORE_SHOW_AGAIN, IGNORE_USE_DEFAULT, IGNORE_USE_SAVED, mButtonData, mCallback, mCheck, mIgnorable, mIgnoreLabel, mLabel, mLineEditor, mOptionChosen, mTextCallback, mUnique, mUserData, LLControlGroup::setS32(), LLControlGroup::setWarning(), sSettings, and sUniqueActiveMap. Definition at line 249 of file llalertdialog.cpp. References LLView::addChild(), BTN_HEIGHT, BTN_HPAD, FALSE, font_name, format(), LLRectBase< Type >::getHeight(), LLFontGL::getLineHeight(), LLView::getRect(), LLResMgr::getRes(), LLRectBase< Type >::getWidth(), LLFontGL::getWidth(), gResMgr, hasTitleBar(), HPAD, i, LINE_HEIGHT, LLBUTTON_H_PAD, llendl, llfloor(), llmax(), llwarns, MAX_ALLOWED_MSG_WIDTH, LLAlertDialog::ButtonData::mButton, mButtonData, mLineEditor, mNumOptions, LLAlertDialog::ButtonData::mOption, LLView::mRect, LLAlertDialog::ButtonData::mSelf, onButtonPressed(), LLModalDialog::reshape(), S32, LLUI::sColorsGroup, LLPanel::setBackgroundOpaque(), LLPanel::setBackgroundVisible(), LLTextBox::setColor(), LLUICtrl::setFocus(), LLRectBase< Type >::setLeftTopAndSize(), LLView::setRect(), LLFontGL::sSansSerif, STD_STRING_STR_LEN, TRUE, VPAD, and y. Definition at line 71 of file llalertdialog.cpp. References llendl, llerrs, llwarns, NULL, sAlertTemplates, and showXml(). Definition at line 63 of file llalertdialog.cpp. Referenced by LLViewerWindow::alertXmlEditText(), and showXml(). Definition at line 504 of file llalertdialog.cpp. References LLModalDialog::draw(), LLControlGroup::getColor(), LLRectBase< Type >::getHeight(), LLControlGroup::getS32(), LLFrameTimer::getStarted(), LLView::getVisible(), LLRectBase< Type >::getWidth(), gl_drop_shadow(), LLFrameTimer::hasExpired(), mButtonData, mDefaultBtnTimer, mDefaultOption, LLView::mRect, S32, LLUI::sColorsGroup, LLUI::sConfigGroup, LLPanel::setDefaultBtn(), and LLFrameTimer::stop(). Definition at line 241 of file llalertdialog.cpp. Referenced by createDialog(), LLNotifyBox::findExistingNotify(), LLNotifyBox::getTemplateMessage(), LLNotifyBox::LLNotifyBox(), and setEditTextArgs(). Definition at line 584 of file llalertdialog.cpp. Definition at line 465 of file llalertdialog.cpp. References FALSE, LLView::focusNextItem(), LLView::focusPrevItem(), LLModalDialog::handleKeyHere(), KEY_LEFT, KEY_RETURN, KEY_RIGHT, KEY_TAB, MASK_NONE, MASK_SHIFT, and TRUE. Definition at line 458 of file llalertdialog.cpp. References LLFloater::getTitle(), LLFloater::isCloseable(), and LLFloater::isMinimizeable(). Definition at line 572 of file llalertdialog.cpp. References LLAlertDialog::ButtonData::mOption, mOptionChosen, and LLAlertDialog::ButtonData::mSelf. Definition at line 598 of file llalertdialog.cpp. References LLControlGroup::addWarning(), LLControlGroup::declareS32(), FALSE, LLUICtrlFactory::getLayeredXMLNode(), IGNORE_USE_DEFAULT, IGNORE_USE_SAVED, LLPointer< Type >::isNull(), llassert, llendl, llerrs, llwarns, LLAlertDialogTemplate::mDefaultOption, LLAlertDialogTemplate::mIgnorable, LLAlertDialogTemplate::mIgnoreLabel, LLAlertDialogTemplate::mIgnoreListText, LLAlertDialogTemplate::mLabel, LLAlertDialogTemplate::mTitle, NULL, S32, sAlertTemplates, sIgnorableTemplates, sSettings, sStringAlwaysChoose, sStringSkipNextTime, and TRUE. Definition at line 367 of file llalertdialog.cpp. References LLView::addChild(), BTN_HEIGHT, FALSE, font_name, LLRectBase< Type >::getHeight(), LLFontGL::getLineHeight(), LLResMgr::getRes(), LLFontGL::getWidth(), LLRectBase< Type >::getWidth(), gResMgr, HPAD, IGNORE_SHOW_AGAIN, LINE_HEIGHT, LLCheckboxCtrl, llfloor(), llmax(), mCheck, mIgnorable, LLView::mRect, LLModalDialog::reshape(), S32, LLRectBase< Type >::setOriginAndSize(), LLCheckBoxCtrl::setValue(), TRUE, and VPAD. Definition at line 95 of file llalertdialog.h. Definition at line 559 of file llalertdialog.cpp. 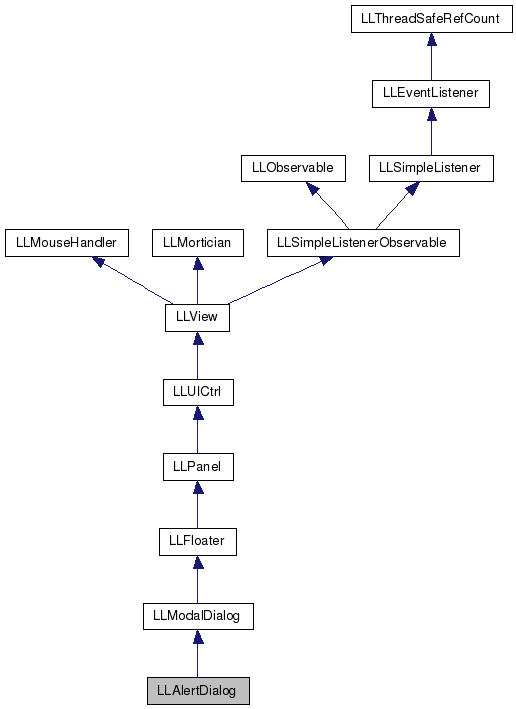 References LLLineEditor::clear(), mLineEditor, and LLLineEditor::setDrawAsterixes(). Definition at line 545 of file llalertdialog.cpp. References format(), LLLineEditor::getText(), llendl, llwarns, mLineEditor, and LLLineEditor::setText(). Definition at line 532 of file llalertdialog.cpp. References llendl, llwarns, mLineEditor, mTextCallback, and mUserData. Definition at line 524 of file llalertdialog.cpp. References LLAlertDialog::ButtonData::mButton, mButtonData, mNumOptions, and LLView::setEnabled(). Definition at line 70 of file llalertdialog.h. Definition at line 403 of file llalertdialog.cpp. References LLModalDialog::centerOnScreen(), make_ui_sound(), and LLModalDialog::setVisible(). Definition at line 171 of file llalertdialog.cpp. References LLFloaterView::adjustToFitScreen(), LLFloaterView::bringToFront(), DEFAULT_BUTTON_DELAY, FALSE, LLControlGroup::getS32(), LLControlGroup::getWarning(), gFloaterView, IGNORE_SHOW_AGAIN, IGNORE_USE_DEFAULT, IGNORE_USE_SAVED, llendl, llinfos, mDefaultBtnTimer, mDefaultOption, mIgnorable, mIgnoreLabel, mLabel, mLineEditor, LLModalDialog::mModal, mOptionChosen, mUnique, LLFloater::open(), sDisplayCallback, LLLineEditor::selectAll(), LLLineEditor::setFocus(), LLFloater::setFocus(), LLFrameTimer::setTimerExpirySec(), sSettings, LLFrameTimer::start(), LLModalDialog::startModal(), sUniqueActiveMap, and TRUE. Referenced by LLViewerWindow::alertXmlEditText(), showCritical(), and showXml(). Definition at line 114 of file llalertdialog.cpp. References LLAlertDialog(), LLAlertDialogTemplate::mMessage, LLAlertDialogTemplate::mModal, LLAlertDialogTemplate::mOptions, LLAlertDialogTemplate::mTitle, NULL, show(), and TRUE. Definition at line 106 of file llalertdialog.cpp. References createXml(), NULL, and show(). Definition at line 98 of file llalertdialog.cpp. Referenced by LLViewerWindow::alertXml(), LLPanelClassified::canClose(), LLPanel::childDisplayNotFound(), createXml(), join_group_callback(), LLNotifyBox::onClickButton(), LLFloaterWorldMap::onCopySLURL(), LLLandmarkBridge::openItem(), and process_alert_core(). Definition at line 124 of file llalertdialog.h. Referenced by createDialog(), draw(), setOptionEnabled(), and ~LLAlertDialog(). Definition at line 114 of file llalertdialog.h. Definition at line 119 of file llalertdialog.h. Referenced by setCheckBox(), and ~LLAlertDialog(). Definition at line 125 of file llalertdialog.h. Referenced by draw(), and show(). Definition at line 117 of file llalertdialog.h. Definition at line 121 of file llalertdialog.h. Referenced by setCheckBox(), show(), and ~LLAlertDialog(). Definition at line 123 of file llalertdialog.h. Referenced by show(), and ~LLAlertDialog(). Definition at line 122 of file llalertdialog.h. Definition at line 127 of file llalertdialog.h. Referenced by createDialog(), setDrawAsterixes(), setEditTextArgs(), setEditTextCallback(), show(), and ~LLAlertDialog(). Definition at line 116 of file llalertdialog.h. Referenced by createDialog(), and setOptionEnabled(). Definition at line 118 of file llalertdialog.h. Referenced by onButtonPressed(), show(), and ~LLAlertDialog(). Definition at line 128 of file llalertdialog.h. Referenced by setEditTextCallback(), and ~LLAlertDialog(). Definition at line 120 of file llalertdialog.h. Referenced by setUnique(), show(), and ~LLAlertDialog(). Definition at line 115 of file llalertdialog.h. Definition at line 133 of file llalertdialog.h. Referenced by createXml(), getTemplateMessage(), LLPanelMsgs::onClickEnablePopup(), and parseAlerts(). Definition at line 137 of file llalertdialog.h. Referenced by setDisplayCallback(), and show(). Definition at line 134 of file llalertdialog.h. Referenced by LLPanelMsgs::buildLists(), parseAlerts(), LLPanelMsgs::resetAllIgnored(), and LLPanelMsgs::setAllIgnored(). Definition at line 135 of file llalertdialog.h. Referenced by LLAlertDialogTemplate::getIgnore(), parseAlerts(), LLAlertDialogTemplate::setIgnore(), show(), and ~LLAlertDialog(). Definition at line 140 of file llalertdialog.h. Referenced by LLAlertDialog(), and parseAlerts(). Definition at line 139 of file llalertdialog.h. Definition at line 136 of file llalertdialog.h.